Last November 22nd, in celebration of the World Fishery Day, fishermen led by Pamalakaya organization denounced the reclamation of Manila Bay. « Reclamation »? What is that? 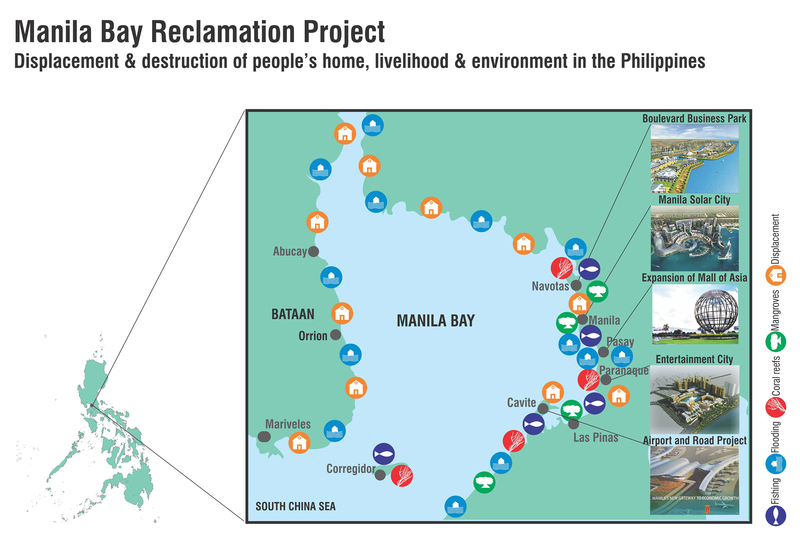 The Philippine Reclamation Authority (PRA) is a governmental agency in charge of the management of the public land domain for the coastal area empowered to deal with real estate, commercial and/or industrial companies who wish to invest and to develop « innovative and long-lasting(sustainable) socioeconomic centers of growth ». Problem posed: article XII (section 3) of the Philippine Constitution forbids private entities to buy lands of the public domain, otherwise than rented for a maximal period of 25 years renewable only once and on surfaces not exceeding one thousand hectares. Problem solved: thanks to the providential system of Public-Private Partnership ( PPP). But lands coveted by the investors were frequently inhabited, and it is necessary to « reclaim » these lands – that’s PRA’s role – to offer to the private partners a legally « safe and comfortable » environment. The map below allows to get an idea of what brews. Two years later, Kevin Rodolfo, a geologist of the University of the Illinois (Chicago), publishes a long article: « Why reclamation of nearshore Manila Bay is a very bad idea ». Global warming provokes a rise of oceans’ level (approximately 1,5 cms/year in the Philippines) whereas the ground of Manila Bay sinks (approximately 2 cms/year for Metro Manila area, mainly because of the excessive pumping of groundwater. Knowing that lands around the bay are hardly a meter above the sea level, we can conclude that a large part of these lands will be under the water before decade. Real estate projects motivating the « reclamations » are going to accelerate the sinking phenomenon by increasing the pressure on the ground. Modification of the natural course of the rivers which throw into the bay (Pampanga and Pasig River) will increase flood risks. Philippines are situated in a zone of strong seismic activity where an earthquake can provoke at any time a liquefaction of grounds, pulling the collapse of the buildings they bear – in 1968, such a phenomenon already occurred, which caused the collapse of Ruby Tower, in Binondo (a Manila district), and the death of 260 people. Not to mention the environmental consequences (pollution, siltation of sea bed, mangrove destruction, decay of coral reefs) and social consequences (eviction of poor communities, less fish for the fishermen, impact on the food safety of poor people for which the products of the sea establish 50 % the calorie intake). If the defenders of the bay counted on the election of Rodrigo Duterte to cancel the National Reclamation Plan thrown by his predecessor, they were disappointed. December, 2016. Manila mayor Joseph Estrada says he was satisfied with the full support of the president to Solar City project (construction of three artificial islands covering an area of 148 hectare, which will accommodate a business center, residential buildings, a shopping mall and an international marina). November, 2017. Director of the Philippine Reclamation Authority Alberto Agra declares that more than 80 of the « reclamations » received an all-out support of the president, in spite of the criticisms of the opponents. “We gather today to assert our right to our fishing waters and call for the scrapping of the National Reclamation Plan (…) It is not too late to rehabilitate and bring back the natural ecosystem of Manila Bay; instead of spending billions on floating commercial and business districts, why not revive and develop the destroyed mangroves and corals of Manila Bay to let marine species thrive”, said Fernando Hicap, Pamalakaya national chairperson, on the World Fishery Day.